Sleepy Root Farm was started by Brandon Wiarda and Kevin Karl in the Spring of 2011, renting land from the fine people at Living Song Farm. 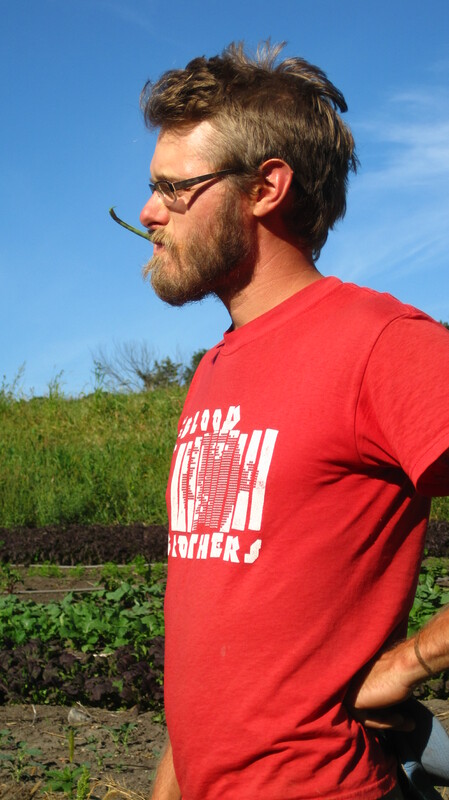 In 2013 Kevin left to continue his education and start his own CSA farm in Canada, Heather joined Brandon full-time on the farm, and we moved the whole operation east of the Twin Cities to the lovely Amery, Wi. area. After renting for three years we purchased and moved to our fabulous forever farm in the fall of 2016! 2016 brought lots of infrastructure improvements like a greenhouse, and agricultural well, and in 2017 we were thrilled to be the recipients of a LOFF grant from the wonderful folks at Lakewinds Co-op. This grant was key to finishing our pack shed and making it a safe, efficient, and fun place to process our produce! Brandon claims Minnesota, Wisconsin and South Dakota as his homes, spending early school years in the city of LaCrosse, and childhood summers on his father’s South Dakota farm. His interest in working with plants, pursuing practical knowledge and skills, and living in rural landscapes led him take on internships with organic vegetable farms in MN after graduating from college. Love of the outdoors, good food, the pleasures of plant husbandry, and the desire to connect others to those same meaningful experiences led him and Kevin Karl to start Sleepy Root. around the country before settling in Minneapolis. A graduate of the Culinary Institute of America, New York, Heather has worked extensively as a baker and chef in New York, Chicago, Vermont, Colorado and Minneapolis. For nine years she was the head chef at everyone’s favorite NE deli and cheese shop, Surdyk’s, where she and Brandon met when Sleepy Root started delivering produce there. Her culinary background brings a unique skill set to the farm and insights in food trends, variety selections, food prep, and recipes. Heather also works part-time at her beloved local library as the Adult Programming Coordinator! May Lee joined the family on November 11, 2014, and has been a total delight to her parents and farm community. Specializing in being cute, she’s the Sleepy Root Farm cheer-builder and funny girl extraordinaire. She is now the 4th generation of Wiardas to farm! And don’t forget Kelsey, who provided plenty of entertainment that first year, matchmaking, and some of these photos!! 😉 Best of luck to you guys. I can’t wait to come visit…I’m learning all about permaculture and food forests here in Pennsylvania, so if you ever need help on a perennial patch and Kevin isn’t around, I’m your girl! !